Winnipesaukee Island Services is proud to offer our plowing, sanding, snowblowing, and roof clearing services to the towns of Alton, Barnstead, Gilmanton, and Gilmanton Iron Works. Please contact us today for a free no obligation quote on your snow removal needs. 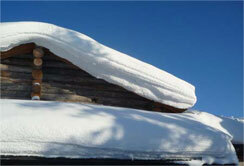 Are you concerned mother nature may have over loaded your roof this winter? Contact us today for a free estimate. Please fill out the form at the bottom of the page or email us with details about your specific needs and we'll get back to you within one business day. Over the winter months do you find yourself worrying about your island home? Do you usually try and get over to the island at least once to make sure everything is okay? Winnipesaukee Island Services can check on your home and give you a detailed report about the condition of the home, amount of snow on the dock, deck, and roof. If you are concerned about the snow build up on your deck and roof we can clear them for you. We have services available so you can spend the winter months relaxing without having to worry about your home. Our comprehensive island checkup includes pictures of your home from 360 degrees around the perimeter. Inspection of your dock, dock circulator, dock check, entry ways, and interior of your home if requested. Please let us know if there is anything else we may be able to assist you with in addition to our standard winter Island Check in the special notes section. Please email us or use the contact form below to receive your free estimate. Concerned mother nature over loaded your deck or roof? Contact us for a free estimate to have it cleared for your peace of mind. Are you and your family planning a winter visit to the island or your summer home? We can arrive before you and make sure everything is ready to go. From having dried firewood, food, and bottled water we have you covered. Concerned about the snow on your deck or roof? We can clear your decks to ensure easy access to your home and grill.